On Wednesday, November 30, Boyer College of Music and Dance students will present The Music of the Great Migration: A Student Performance. 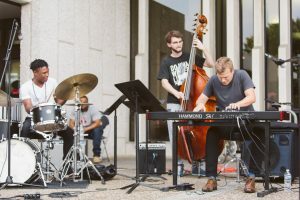 The program, produced as well as performed by students, is the result of their semester-long research of the culture, music, and history of this time period. This performance marks the culmination of their hard work, creativity, and talent and will begin at 12:00 PM in the Ground Floor Lecture Hall at Paley Library. The Music of the Great Migration: A Student Performance features musical performances by: Noah Hockner-trumpet, Silas Irvine-piano, Josh Lee-Bari sax, Chris Lewis-tenor sax, Chris Oatts-alto sax, Nathan Pence-bass, and Donavan Pope-drums. This performance is the final event in Temple University Libraries’ programming series The Music of the Great Migration, marking the 100th anniversary of the historic and culturally important movement of 6 million African Americans to the urban Northeast, Midwest, and West. 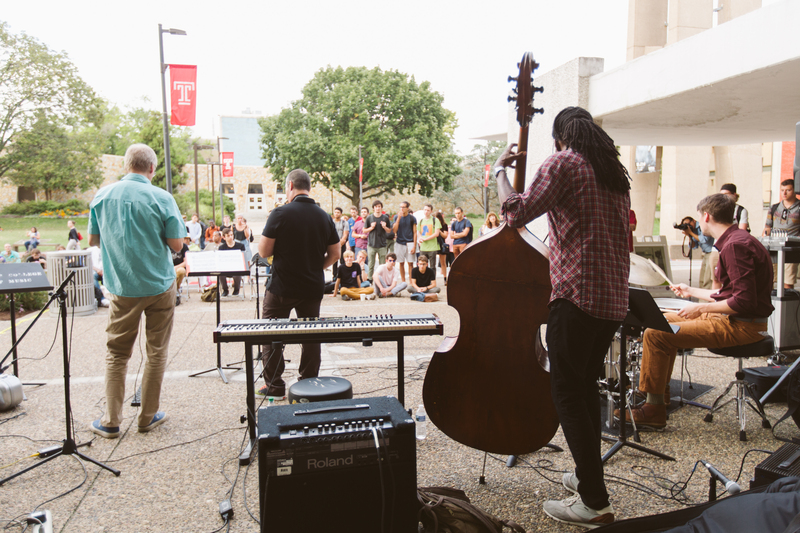 This series featured musical performances, exhibitions, and film screenings, and encouraged students, faculty, and community members to enjoy the music of the Great Migration and participate in dialogues about the notable figures and history behind the music. 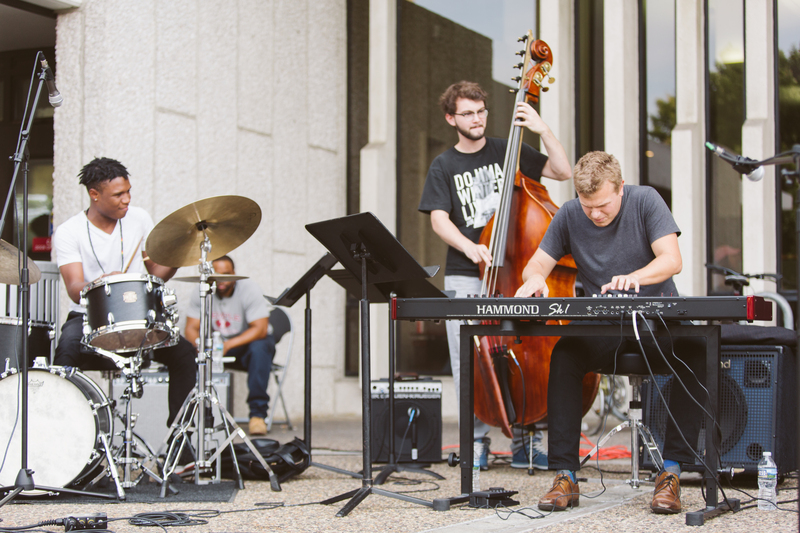 The Music of the Great Migration kicked off during Homecoming with the Coltrane Festival at the Bell Tower. 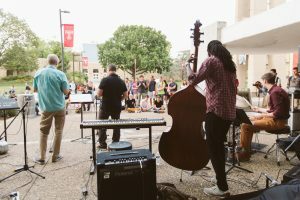 Crowds gathered to enjoy the warm weather and the music of Philadelphia Jazz great John Coltrane as performed by the Chris Lewis Group, Bootsie Barnes Group, Tim Warfield Group, and Ben Schachter Group. 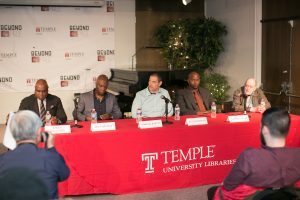 What Coltrane Means to Me: Musicians Discuss the Influence and Impact of the Jazz Great provided another opportunity to learn about John Coltrane and his continuing presence in Jazz music. Jazz musicians and critics shared their personal experiences with Coltrane’s innovative music and the impact it has had on their own work. The discussion was preceded by a Meet and Greet at the Blockson Collection. While The Music of the Great Migration: A Student Performance is the final event in the programming series, there are still opportunities for you to explore the legacy of John Coltrane and the Great Migration. The Blockson Collection is currently exhibiting A Love Supreme, a collection of album covers, photographs, posters, and other heirlooms related to John Coltrane which will be on display through December. Also at the Blockson Collection is Lord I’m Moving On: Celebrating the Great Migration. This exhibition runs through January and tells the story of the Great Migration, with a special emphasis on Philadelphia. We encourage you to stop by the Blockson Collection to check out these exhibitions before the student performance. The Music of the Great Migration is presented in collaboration with: the Philadelphia Jazz Project, Ars Nova Workshop, Boyer College of Music and Dance, and Scribe Video Center, with a special thanks to Terell Stafford, director of jazz studies and chair of instrumental studies at Boyer.